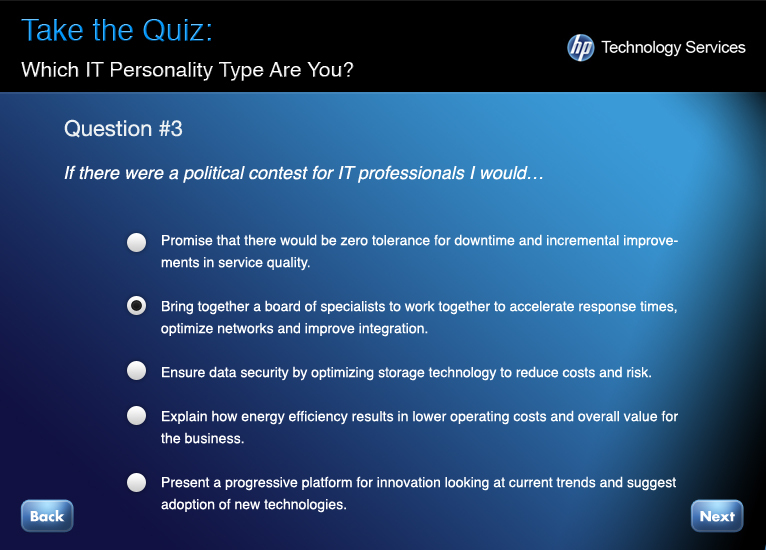 Align online presence of HP Technology Services to brand positioning, "bringing the humanity to technology solutions" for B2B consulting by creating an online sweepstakes website and Facebook application. Provide greater understanding of HP Technology Services and raise the profile of HP subject matter experts to align with brand positioning “bringing humanity to technology solutions” and consulting in a B2B market. Create an online sweepstakes website leveraging previously created video assets to garner engagement. The videos feature six of 21 experts’ abbreviated profiles with videos. 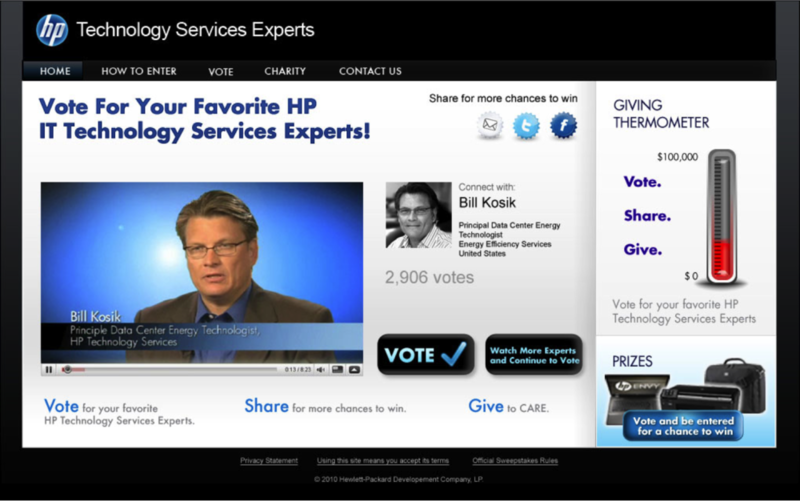 The sweepstakes required users to vote for their favorite HP technology experts while encouraging them to learn about HP’s consulting services. Facebook app, Social media strategy and targeted online advertising create buzz and generate traffic to the microsite. Managed onsite and offsite resources from concept to launch creating project plans, briefs and assessing estimates for offshore resources. Scheduled meetings to help manage timely client feedback. 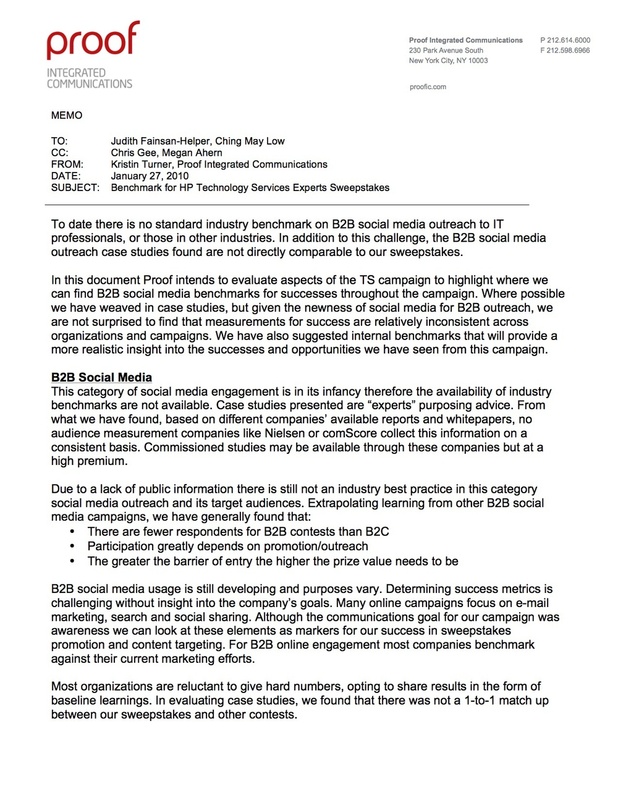 Conducted secondary research on contests/sweepstakes engagement to draft a strategy brief for benchmarking. With client approval I drafted sweepstakes guidelines for contest vendor. I curated video roughs for editing and wrote the copy for the sweepstakes. UX deliverables included user flows for both the sweepstakes and Facebook application. For the sweepstakes site a site map and annotated wireframes for pre and post-launch were also delivered. I oversaw the visual design and development as a brand guardian and project manager, presenting deliverables for client sign off. 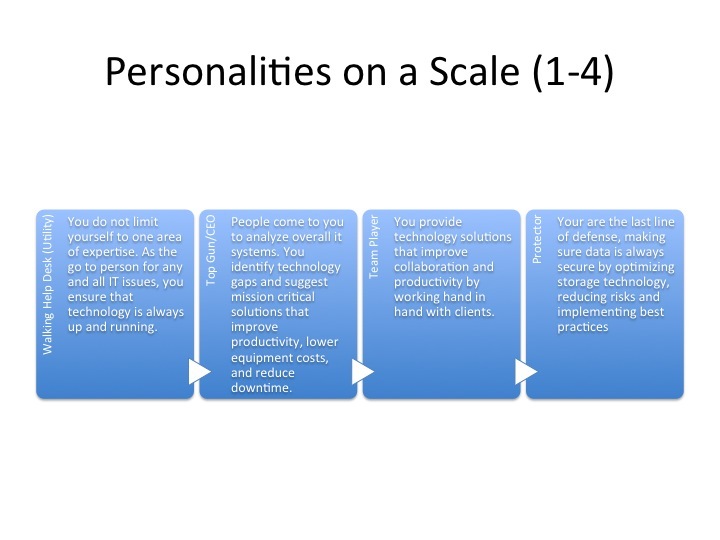 My role on the IT Personality Quiz continued to span project management, strategy and user experience design. 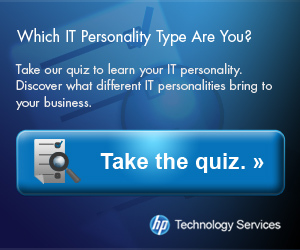 Based on proprietary CIO research provided by HP, I segmented the target audiences, created target customer profiles and mapped the personalities back to the experts featured in the sweepstakes. In addition, I wrote the copy for the quiz and created a point system to categorize quiz participants to drive users back to relevant experts. We monitored traffic and created weekly reports tracking onsite engagement as well as traffic sources. To increase qualified leads we recommended targeted LinkedIn advertising. The client managed the advertising engagement while we delivered the creative.